I thought it would be fun to start doing the recipe exchange. You can use any kit you'd like. The recipe card needs to be a 5x7 size. For the month of October post any recipe that you like that is good in the fall. This could include apple, pumpkin, casseroles, etc. Post it to the gallery and here (include link to gallery) and then send it to me using "http://www.yousendit.com/". Be sure to name it "SS_OctRecipeExchange_yourname". Send it to "RecipeExchangeSumScrapper@gmail.com". It's due by the end of this month. That looks good....only thing is my family don't care for raisins....what if I left them out? Oh the choice of kit was perfect for it too! Thanks millions. 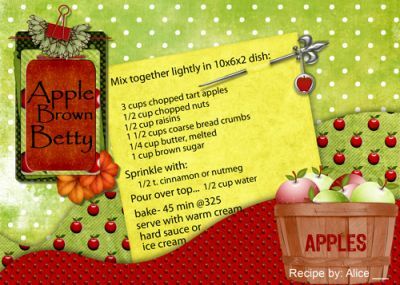 Very pretty recipe card, M.
Yum, yum, Michi! And you "prettied" it up too!! !